WHEN I WAS 13, I was a Mr. T Experience fanatic. I can’t pinpoint how or why I became so enthused about the Berkeley-based punk band, but I can safely say that singer Dr. Frank’s catchy combination of high energy and low self-esteem helped get me through my first few awkward years of adolescence. So when I found out that Frank Portman, aka Dr. Frank, had written a book, I hightailed it to a bookstore and bought the last available copy of his novel King Dork. When I got home and opened the three-hundred-plus-page book and read the synopsis, I wasn’t surprised to learn that the story’s protagonist is a 14-year-old, hyper-intelligent, super precocious rock-junky nerd with a big vocabulary and a penchant for cracking codes. What else could I have expected from Dr. Frank? After all, he himself has played the part of king of the dorks for over two decades, writing off-the-wall ballads for the hopelessly loveless and misunderstood, and recording album after album giving all the teenage geeks, dweebs and misfits something to sing along to as they are shoved into a locker, tripped in the hallway, or pantsed during gym class. As I read King Dork, I felt nostalgic for all the Mr. T Experience shows I begged my parents to let me go see, and for all the times I locked myself in my room and put Revenge Is Sweet and So Are You on full-blast. That dumb little band was more important to me as a 13- to 15-year-old kid than pretty much anything else. It could be that reading King Dork reminded me of my own teenage experiences because, obviously, it’s a book about a teenager, although I think it has much more to do with the nature of the writing itself. Dr. Frank has a kind of eccentric, hyperactive and very distinctive voice and style that comes through in his songwriting, and it’s that same sincerity and endearing quirkiness that makes King Dork and its protagonist, Tom Henderson, so lovable and, more importantly, so relatable to former teenage dorks like me. Frank Portman’s deep-seated roots in punk rock have had a heavy influence on his novel, and despite the fact that when he began writing King Dork, Portman admittedly didn’t have much of a plot in mind, he already knew his central character well. Ten years prior to the novel’s publication, Tom Henderson was born on the Mr. T Experience album Love Is Dead, which was first released on Lookout! Records in 1996. Over a few drinks one foggy Saturday afternoon at a café in Oakland, Portman and I talked about punk rock, his book, his band and his newfound (and rather unexpected) success as a writer. The story of King Dork is part meta-mystery, having to do with a code found on the inside cover of an old copy of Catcher in the Rye; part teenage rock-’n’-roll fantasy, including several songs; and part classic high-school misfit story. Although much of King Dork shadows some of the events that take place in Catcher in the Rye, simultaneously and somewhat ironically (albeit intentionally), many pages are also dedicated to Tom Henderson’s detailed bashing of the book. King Dork is structured in a way that allows Portman to poke fun at the cult following that Catcher has accumulated over the years, as well as reimagine the classic coming-of-age story by using the exemplary novel of that particular genre as a model around which to build his own novel. The key element, I think, that makes Portman’s book so successful and so honest as a testament to just how tough it is to be a teenager, is the fact that unlike many other YA novels, and those of all genres for that matter, the story is somewhat unresolved at the end. Instead of solving the cipher around which the book is loosely based, or triumphantly climbing to the top of the social pyramid and giving hope to all underdog dorks, Tom Henderson ends up pretty much where he began: He’s still a confused, self-conscious, horny 14-year-old nerd. King Dork tells a story, above all, about an average kid trying to survive in the somewhat warped world that is high school (and maybe get a little action in the process). The code, in addition to serving its purpose as a literal code that may or may not uncover a secret very significant to Tom Henderson, represents adolescence and life and perspective, and most importantly, the confusion and uncertainty of growing up. The code is therefore more of a foil for the rest of the story and for the development of Tom Henderson as a character than a centerpiece of the plot. The book was obviously going to be about a disaffected teenager, but there is all sorts of stuff dealing with alienated teenagers throughout our popular culture, and there’s always something a little off about them that doesn’t translate into real life. There’s always a you-win-in-the-end kind of thing, and that’s not the experience that you have. I mean, Tom does all right in the end, but not in that style of Napoleon Dynamite where he wins the dance contest and then everything is suddenly all right. Tom is trapped in a world where nobody will ever let [him] into their club… That Revenge of the Nerds version of a socially unsuccessful kid is not even remotely relatable to me, not even in that ’50s-style cliché of the dork where he finally beats the fraternity guys by becoming just like them. Thing is, you don’t want to be just like them—you want to destroy them! You don’t want to go to the prom, you want the pig blood to be dumped and you want everybody to die, you want the whole gym to catch fire. … I wanted [the book] to be truer to life, because you know that when you really have things that you’re trying to find on microfilm, man it’s always the one that’s missing. And in the end, you get distracted by a girl or some- thing anyway. The sincerity and honesty of King Dork is what truly sets it apart from other books on the YA shelf, and makes it a worthwhile read for 14-year-olds as well as adults who remember being 14-year-olds. And of course, if you are or have ever been a Mr. T Experience fan, this book is for you. King Dork manages to preserve all the weirdness, quirkiness and cleverness of Portman’s song lyrics, as well as his teenage sense of humor, while simultaneously employing the wisdom and reflective edge of someone who managed to suffer through high school and live to tell about it. Juliet Linderman was born and raised in San Francisco, and is currently living in New York City. She is a third-year student at NYU. 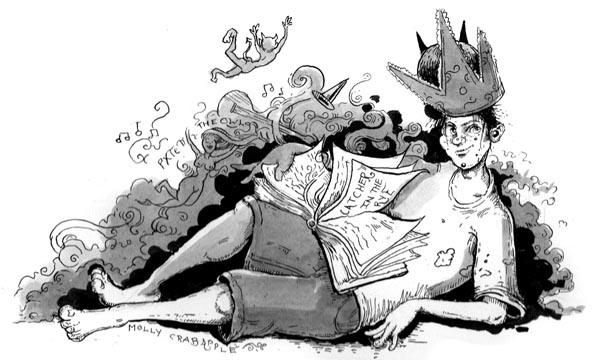 This entry was posted in Louder Than Words and tagged Juliet Linderman, ks15, Molly Crabapple. Bookmark the permalink.